Little Puppy’s persistence wins him an unexpected friend. When the school bus departs, Little Puppy is left alone with his red ball and without playmates. Initial attempts to engage a man sleeping in a hammock, a group of big dogs and a cat provoke respective comments of “Too lazy. / Too mean! / Too boring.” When Little Puppy encounters the eponymous Big Green Monster, it is sitting on a bench reading a book, and even though the big dogs were intimidating, Little Puppy approaches the monster and tries to play hide-and-seek and tag. Undeterred by repeated rebuffs, Little Puppy dogs the monster as it tries to simply have some alone time with its book, and he even follows it back home. Ultimately, the monster softens a bit when Little Puppy licks its face, and the new friends end up curling up together for bedtime snuggles. 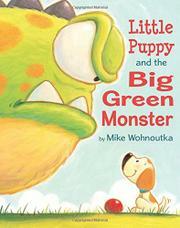 Throughout, softly sweet, cartoonish illustrations depict the intrepid puppy and the big green monster, both of whom are quite cute in very different ways, with an emphasis on scale; that monster sure is big. Vignettes convey the slapstick of the interactions, while full- and double-page spreads emphasize emotion.